When I’m shopping for a product, it’s inevitable that I end up on Amazon. Where else can I buy a pair of earbuds, a baking pan, and feed my kitty’s catnip addiction at 2 a.m., all without getting dressed? As the largest online retailer in the world that caters to impulse purchases, Amazon is the site where sellers flock to hawk their goods. In fact, independent sellers, known as third-party sellers on Amazon, make up 50 percent of Amazon’s total sales, as was reported in the Amazon letter to shareholders in April 2018. With that much cash on the line, unscrupulous behavior is bound to appear among Amazon’s less than forthright dealers. Last year, online shoppers reported 57 phony sellers every day, says Marketplace Pulse. Clothing and accessories—Nike shoes, Rolex watches, Louis Vuitton bags—and electronics are often targeted by counterfeiters, but a recent Wall Street Journal article states that smaller brands are also plagued. But any product can be vulnerable to knockoffs. And merchandise duds aren’t the only things to be wary of: Fake product reviews, payment scams, and the illegitimate sellers themselves all threaten consumers. So what’s a shopper do? We make it easy for you. Here are 6 Amazon shopping pitfalls and how to avoid them. How do these fake reviews get posted in the first place? Well, a business is paid to create dummy Amazon accounts and then make purchases from Amazon. They then write four-star or five-star reviews of products ranked by Amazon as “verified purchases.” Okay, yes, they did buy the product, but it was regular consumer purchase. Similarly, a business can be paid to write a slew of negative reviews about a client’s competitor. It’s why review analysis tools like FakeSpot are so helpful. Of course, FakeSpot isn’t perfect. While some products may get low grades, that doesn't necessarily mean they're bad. When I checked Apple's EarPods, Fakespot gave the product page a C grade, even though the company selling them was Apple itself. So use Fakespot just as a starting point in your research to spot fake reviews. Generally speaking, the more credible reviews a product page has, the more likely it's a product that's going to serve you well. They’re written within a few days of one another. They feature similar-looking user photos. They use similar or the same review phrases. The reviews have one-star or five-star ratings, but the descriptions are generic one-liners and don’t say what makes the product great or poor. When it comes to third parties, be cautious. Avoid new sellers with limited feedback, sellers with low ratings, and sellers with abnormally-high shipping rates. In 2017, more than 21,000 scam sellers were identified by Marketplace Pulse and seventy-seven percent were on Amazon.com. 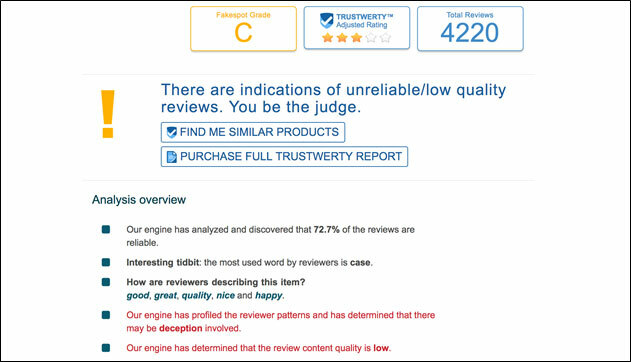 While it may be easy to fake product reviews, you can’t falsify seller ratings because they’re based on Amazon’s own data, writes ecommerce expert Krista Fabregas. Amazon’s algorithm looks at customer ratings and complaints, shipping timeliness, number of returns, credit card chargebacks, among other criteria. The rating is scored on a scale of 0 to 100. “If a buyer is interested in a third-party seller's item and that seller has a high seller rating, they can buy with confidence,” Fabregas adds. If you do run into a bind, Amazon’s A-to-Z Guarantee has your back: The timely delivery and condition of any item purchased from third-party sellers via Amazon.com or Amazon Pay are protected. But to alleviate potential issues with shipping and returns, only purchase from sellers who have “Ships from and Sold by Amazon.com” or “Sold by third-party seller and Fulfilled by Amazon.” To find this info, scroll below the product description, to “Frequently bought together,” and click “Show details.” This will expand the shipping fulfillment details of the product and its accessories. Last month, an unknown Young Adult novel rocketed to the No. 1 spot on The New York Times’ best-seller book list. Turns out, someone went on a spending spree at bookstores that tally book orders for the coveted list. If even the Grey Lady is not immune to seller tricks, Amazon’s best-seller lists can be gamed as well. 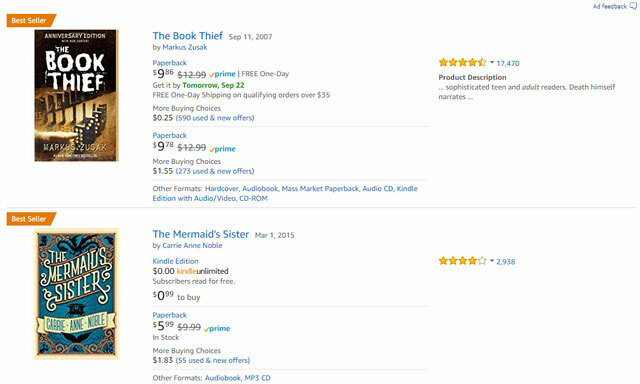 Ideally, Amazon best seller lists (which are updated hourly) are a good indicator of how well a product is selling, but they aren’t always accurate. Here’s how it happens: illegitimate sellers hire workers to search for their products, spend time on their product pages, and add their products to Amazon Wish Lists. 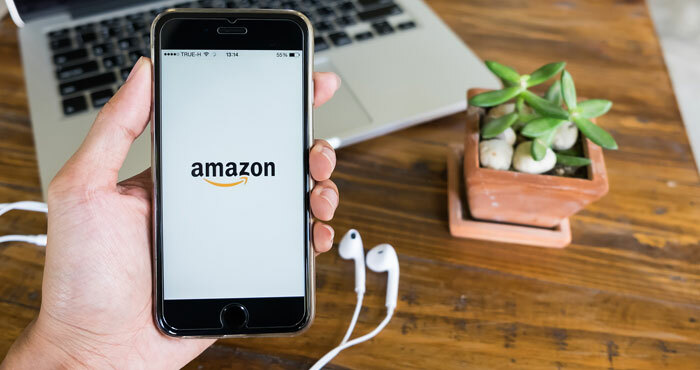 These tactics play well with the Best-Seller tag because Amazon’s algorithm measures what is both purchased and viewed by users, reports Lifehacker. To avoid getting duped by bad tags, use the same tactics mentioned above: Only purchase from Amazon fulfillment sellers and check the legitimacy of product reviews. Additionally, if any one best-seller tagged product has a limited number of reviews compared to a well-known product with thousands of reviews, it probably isn’t up to snuff. Earlier this year I found a great deal on a grocery store item that I regularly purchase. With hopes of saving a few dollars, I clicked Amazon’s Subscribe & Save button for the first time. The button allows shoppers to get an item shipped automatically at regular intervals so you don’t have to order it each month. However, I was shocked to find out the product price nearly doubled a month later compared to the first time around. Though not a true scam, Amazon’s subscription button won’t lock in a price, just the purchasing schedule. “The price of the item may decrease or increase between deliveries, but will never be higher than the price shown in your reminder email,” reads their (small-print) terms and conditions. Lesson learned: Always pay attention to the reminder emails Amazon sends between deliveries. Each email details your processing information, the price, and any discounts applied to your order. If Subscribe & Save isn’t for you, or if you need to cancel an overpriced product, log-in to your account > click on Your Subscribe & Save > hover over the subscription item you want to cancel and click Edit > click Cancel > click Confirm. Beware of third-party sellers who direct you off Amazon.com to pay for a purchase. A legitimate seller transaction will always occur on Amazon. If a seller asks you to send a payment by cash, PayPal, a wire transfer, or other means, don’t do it. Amazon accepts credit cards, debit cards, Amazon gift cards, ACH-enabled U.S. checking accounts, Shop with Points credit card rewards programs, and cash on delivery (for select international destinations). And remember that Amazon-branded gift cards can be purchased only from Amazon.com and authorized retails, such as 7 Eleven, Lowes, and Walgreens. (Find the complete list of retailers here.) And just as with your credit card info, never share your gift card number with someone unknown, electronically or otherwise. Do you ever find an email in your inbox that seems legit, but when you open it reminds you of the early days of AOL chain letters or unwanted images of a stranger’s you-know-what? If you’re lucky, your email provider automatically filters these into your spam folder. If it doesn’t, you may fall victim to that impulse click to check on the status of that “forgotten” Amazon shipment. There are simple ways to avoid putting your identity at risk by never clicking on a link within a suspicious-looking email ever again. How can you tell if the email’s bogus? If you don’t recall placing an order, that’s a First, big red flag. Second, if it includes an order confirmation attachment, that attachment probably contains a virus; so don’t click on it! Third, if the email directs you to send your Amazon.com username and/or password, other personal information, or payment information, it’s immediately suspect. Lastly, it may feature serious typos and branding that don’t mirror Amazon’s clean design. But what about those emails that look like the real thing? Play it safe and don’t click on any links within the email—always visit Amazon’s website directly. To identify spoofed email addresses or URLs, check the extension. Genuine emails from Amazon always come from an address ending in “@amazon.com.” They’ll never be sent from or direct you to reply to a seller-performance@payments-amazon.com for example or amazon-security@hotmail.com. Similarly, genuine Amazon website addresses always end with “amazon.com” and they never use a combination like “security-amazon.com” or “amazon.com.biz.” To spot these fake URLs in hyperlinked images and texts within the body of an email, just hover over the object. At the bottom of your screen, you’ll see the URL that you’ll be directed to if you click on the link. Or, right-click, select Copy Link, and paste it into your word processor (don’t paste into your web browser!). My solution to this is to not buy on Amazon any more. They’re trying to put all other businesses out of business. Support SMALL business or you’ll have nothing left but Amazon! Great thought, Deb!....there are lots of folks who think like you. Except there are checks and balances in the free enterprise system that make this kind of scenario unlikely. How? By folks like you….lots of them who affect the market by how they shop….or don’t. Cool, isn’t it? Most of what I buy on Amazon is not sold by a third party, but I do know about Amazon doing corrective review status such as they did to push Hillary’s book to be classified as a top rated best seller (which it really isn’t). But for a book as bad as that one, it pays to buy it on the cheaper price on Amazon. I do know that some of the sellers on Amazon are people who buy and resell their purchases. Depending on the product, you may do well with purchase or not. I don’t buy any product that had been refurbished unless it is a company with excellent rep. Amazon doesn’t remove a seller unless they get a large number of complaints from the customers and then that seller will be banned off site. This has happened twice lately it tells me to use a different card, I was only going to download a music track, but twice now this has happened, tells me there is something wrong with my card details I don’t know when I go to help it is just too confusing..
Great journalistic research. It’ s pretty easy to quickly discover that fakespot is fake. Duh. Are you suggesting Fakespot doesn’t do what it claims to do by using an algorithm to identify potential fake reviews? Or do you simply not agree with the results that you get from Fakespot? Either way, care to share any examples that support what you’re saying? @Josh Kirchner, LOL, big shocker, “Ann Smith” is a paid troll who is trying to debunk Fakespot. Sorry to all the Ann Smiths and Bill Jones of the world, we tend to take your comments with an ounce of skepticism.